The latest range from French skincare experts NUXE has us combination-skin girls jumping for joy. 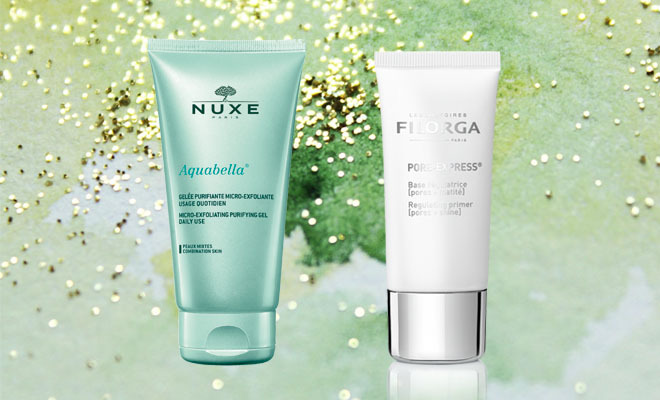 Aquabella is a three-step routine containing White Waterlily, Natural Origin Hyaluronic Acid and the NUXE-patented “Natural Blur Complex”. The objective? To put an end to the eternal dilemma of combination skin by providing moisture to targeted areas of the face. Dehydrated areas become plumper and oily areas are pure and clear. No more shine, just a natural radiant freshness. The cleanser has the most heavenly scent and leaves the skin feeling thoroughly cleansed without any tightness. Plus, we love that the exfoliating beads consist of a natural fibre and not plastic – yay for being more eco-friendly. Once you’ve tried a primer, there’s no going back – the flawless finish it gives your foundation is incomparable! We love this new dual-action primer from Filorga. It’s the perfect choice for anyone who struggles with large pores, shine or imperfections as it provides an instant matte and blur effect. The skin stays matte all day as excess sebum is absorbed by mineral sebum captors and optical blurring agents refine the pores and skin texture. It has a silky-smooth texture so it applies effortlessly, and it really gives your foundation a flawless finish that lasts for hours. Available at selected Edgars, Red Square and Clicks stores. We all know and love Bio-Oil, so when this brand new gel hit the market, we had big expectations. The first new innovation in 30 years, this gel was designed on a simple principle: creams and lotions usually contain around 70% water, almost all of which evaporates when it is applied to the skin, therefore it doesn’t give skin the moisture it needs. Bio-Oil replaces this water with oil, which acts as a barrier – it prevents moisture from escaping the skin. The product is thus 100% active, unlike many other creams and gels which contains inactive water. It feels rich and luxurious, and leaves skin feeling soft and hydrated, with a light sheen. Plus, it has the signature Bio-Oil scent we love. This is an essential for anyone who as dry skin – plus, it’s suitable for all skin types! Available at pharmacies and select retail outlets. Natural and organic skincare has really taken off in South Africa, and with good reason. As we begin to understand the magnitude of the damage we’re doing to the earth, the relevance of eco-friendly beauty products becomes more and more apparent. 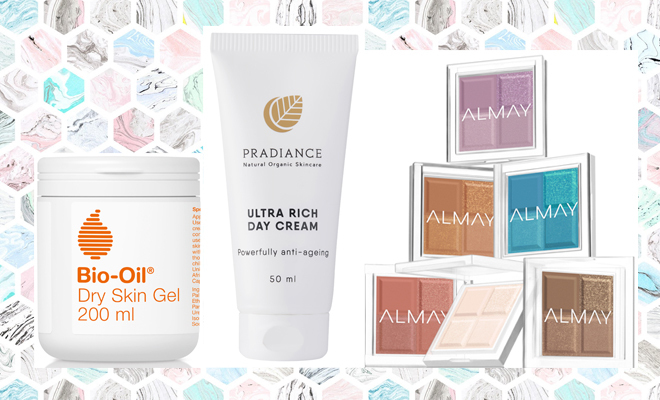 Pradiance is a proudly South African skincare brand that’s 100% natural and made with organic ingredients. This new day cream is the newest launch in their staple, and features the Kigelia (African Sausage Tree) as the main ingredient. This age-old gem assists in balancing skin tone, pigmentation, scarring, and it also has renowned anti-ageing benefits. We love how hydrating this day cream is, and that aloe is added for a soothing effect. It contains absolutely no chemicals, parabens or mineral oils and is vegan-friendly too. Available at Wellness Warehouse and www.pradiance.co.za. What if we told you your favourite eyeshadow shade was conveniently available in one palette, in four different finishes? Almay’s granted our wishes with this new release. Inspired by the latest colour blocking trends, each quad contains matte, satin, metallic and glitter versions of one on-trend shade. The shadows are velvety smooth and contain luminosity boosting agents to deliver bright, beautiful colour. There are ten shades to choose from, and we highly recommend #150 Pure Gold, Baby, for the upcoming festive season. Available exclusively at Dis-Chem.